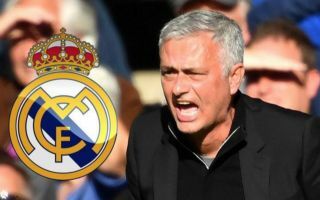 Manchester United manager Jose Mourinho has reportedly held some initial talks with Real Madrid president Florentino Perez about replacing Santiago Solari. This could mean a second stint at the Bernabeu for the Portuguese tactician, despite his recent struggles as United manager and a disastrous end to his time at Chelsea a few years ago. Don Balon cite journalist Eduardo Inda as saying Mourinho is Perez’s target to replace Solari if the Argentine cannot win the Champions League. The report adds that Mourinho would want to sign Tottenham striker Harry Kane for Real if he joins, with the Red Devils boss keen to have plenty to spend. Kane has been exceptionally prolific in recent seasons, twice winning the Golden Boot with Spurs and looking capable of making the step up to a bigger club. The England international looks much needed at Madrid as well following the summer sale of Cristiano Ronaldo to Juventus, while Karim Benzema also looks past his best. Tottenham have the unfortunate recent record of losing their best players to bigger clubs, with Gareth Bale and Luka Modric both moving to the Spanish capital in recent years. In truth, Mourinho could do with Kane at United right now, with his side struggling and looking in need of an injection of quality up front as the struggles of Alexis Sanchez and Romelu Lukaku contribute to putting the former Chelsea boss’ Old Trafford future in serious doubt.